LEXINGTON, Ky. (Nov. 5, 2018) — Starting Nov. 7, prices will go up for the Thanksgiving Break Bus Charter Service. Regular pricing ends on Tuesday, Nov. 6, so book your trip now for the best rates. This service — formerly known as Ride Home Express — is now offered through BreakShuttle, in cooperation with University of Kentucky Transportation Services. 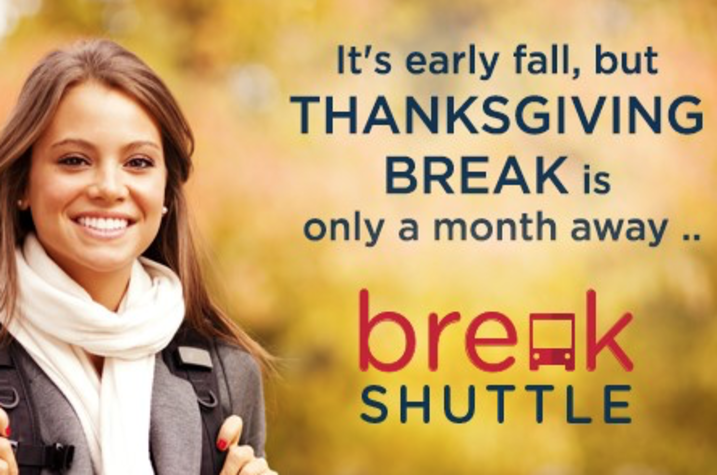 The BreakShuttle service enables students, faculty and staff to take a charter bus from campus to their hometowns and other destinations during major academic breaks. The service stops at numerous cities along three routes: Atlanta, Chicago and Cleveland. For Thanksgiving Break, the service will depart from Kroger Field at 4 p.m. Tuesday, Nov. 20, and return to campus on Sunday, Nov. 25. More information about schedules, prices and links to purchase tickets can be found here. UK Transportation Services will also provide free campus shuttle service to Kroger Field on the day the charter buses are scheduled to leave. Registration is required and can be done online. Complete details about shuttle pick-up locations and times can be found here. Students, faculty and staff returning to Lexington from Thanksgiving break will be able to take the Yellow Route (#27) back to campus on Sunday, Nov. 25. BreakShuttle is the nation’s largest provider of college break transportation services and contracts with fully insured and compliant charter companies. Wells + Associates, a transportation consulting company, wholly owns BreakShuttle. For more information about BreakShuttle, visit their website.